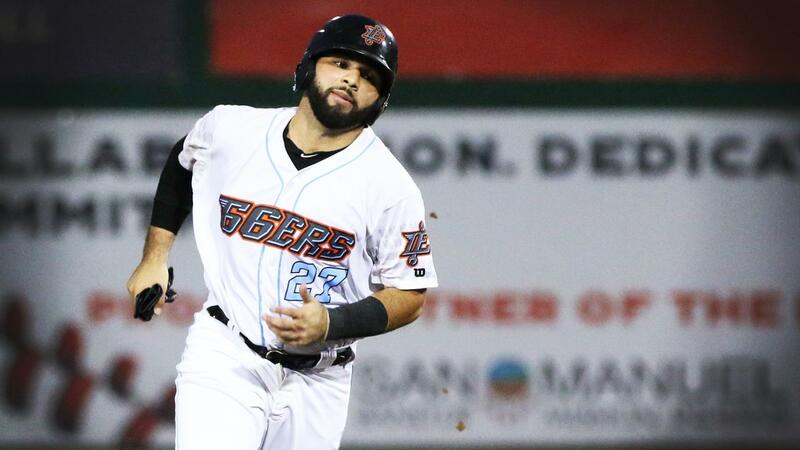 Rancho Cucamonga, CA- The Inland Empire 66ers of San Bernardino dropped a series opener at LoanMart Field of the Rancho Cucamonga Quakes 6-3 on Friday. The Sixers remain mathematically alive in the playoff race in the Cal League's Southern Division but are three out with three to play and all three are versus Rancho Cucamonga who improved to 20-7 in 2018 against the 66ers. The Quakes (84-53, 49-18) jumped in front in the first when Donovan Casey lifted a three-run homer to right, his sixth, against IE starter Erik Manoah (2-12). Omar Estevez hit the second of the Quakes four homers when he lifted a solo shot in the second for his 15th of the year and extended his hit-streak to 22-games. Cody Thomas opened the fifth with a solo homer, his 18th making it 5-0. Manoah then hit the next batter Cristian Santana with a pitch prompting the benches to clear and Manoah's ejection. Nick Yarnall added a solo shot in the sixth. Trailing 6-0 through six frames the 66ers broke through in the seventh when Brandon Marsh singled and David MacKinnon walked against RHP Jordan Sheffield. Julian Leon then followed with a three-run blast to left field making it 6-3. It was Leon's 11th of the year with Inland Empire and his second in two days since being activated from the DL (concussion). Ryan Mosely (6-3) was credited with the win out of the pen while the 66ers did bring the potential tying run to the plate in the ninth but Logan Salaw struck out Franklin Navarro to end the game and notch his third save. Torii Hunter Jr. was hit by the first pitch of the game from Quakes starter Wills Montgomerie and left the game after the half inning. The series continues at Rancho Cucamonga on Saturday at 7:05 pm. The contest can be heard live on 66ers.com.